ATLANTA, GA — Atlas Roofing has long offered a free account-based marketing program for roofing contractors, known as Atlas Signature Select®. With the recent re-design and functionality upgrades to its corporate website, the Signature Select® contractor user interface's look and feel got a re-vamping of its own. Now renamed Atlas Pro, the features, benefits, selling tools and rewards that contractors love are still just a click away. 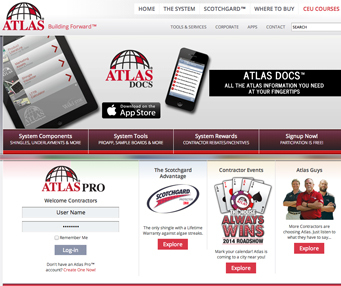 A free Atlas Pro account doubles as login credentials for the Atlas ProAPP™ for iPad, a contractor-centric approach to project management, estimating software, unique selling tools, and more for the contractor on the go. Atlas ProAPP™ and the web based Atlas Pro account also allow contractors to register warranties, track storms, and order marketing materials shipped to their doorstep. Additionally, Atlas Pro membership provides the option to have the innovative Shingle Visualizer installed on the contractor's own website. This allows for a more personal approach with their customers, without third party distractions. Contractors registered with Atlas Pro are also eligible for exclusive rewards, including unlimited cash earnings when using the full Atlas system of products on the roof. "Our contractor partners are professionals," said Stan Bastek, Northeast Region Manager for Atlas. "We want to help their business with tools that make their job easier." To sign up for a free account and take advantage of the full offerings from Atlas, or just to see the changes that have been made to the new website, visit AtlasRoofing.com/pro.